This entry was posted on February 6, 2015 by David Tetlow. Philips Lighting worked with Dutch Carpet Company Desso to create a digital carpet. The carpet would incorporate LEDs in to it in order to display fire exits or to just display messages. 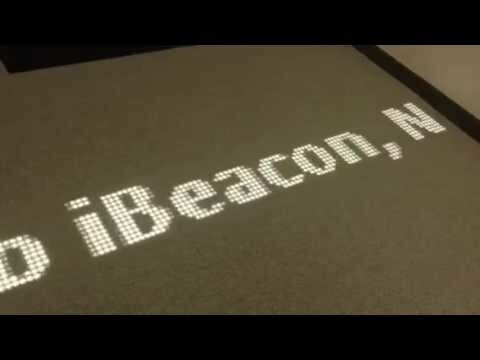 The carpet can be pre-programmed by an app to display what you want and when the LEDs aren't in use they turn off becoming invisible and the carpet looks just like a normal carpet. The LEDs are underneath the carpet so that if anything is spilled on the carpet the lights will not be damaged. The LEDs by Philips come in a variety of colours and can change the look of a room in seconds. They can display the way to exits in a fire or give directions which takes away the need for signs stopping walls from becoming cluttered. It can also be linked to a news feed supplying people with important updates. An example of the carpets in use is at Axel Springer, a Publishing Company in Berlin, who use Luminous Carpets in its newsroom entrance of the BILD Newspaper. Chief Editor of BILD Newspaper, Kai Diekman, said: "When I heard about the new Luminous Carpets solution by Philips and Desso, I knew this solution - displaying the latest news on the floor - was ideal for the entrance of our future newsroom." Venture Manager, Dr Bernd Voelpel, said: "Luminous Carpets has literally countless application possibilities offering architects and interior designers true design freedom. Instantly creating different moods and settings, interiors and ambience. It's imagination at the touch of a button."